Since its inception in 1995, Pokémon has captured the world’s hearts with their adorable, but often fierce, fictional creatures. With now over 721 Pokémon across 6 generations, it is no wonder why this Japanese franchise made a huge impact on pop culture all over the globe. Young adults of today definitely heard or adored the franchise which in turn made a niche in the body art industry and thus, Pokémon tattoo designs were born. We’re quite sure that since you are reading this article, you are thinking of getting a Pokémon-inspired design be tattooed on your skin. Well, look no further as we will give you a brief background of the franchise, meaning of tattoo designs inspired by the franchise, and body placement for this specific tattoo design. 2 Where to Place A Pokemon Tattoo? The Pokémon franchise was created way back in 1995 by under Nintendo and Game Freak as a game on the Game Boy gaming platform. The franchise debuted with resounding success and critical acclaim. Since then, the franchise grew into more branches of media like television and manga which captured the world’s attention and adoration. The franchise revolves around a child that starts an adventure into a world filled with other-worldly creatures that are called Pokémon. The child trains the pokémon and battles against fellow trainers and pokémon while exploring the world and making new friends. This long winding adventure resulted to 6 generations, 721 Pokémon divided into 18 types. within 23 years. 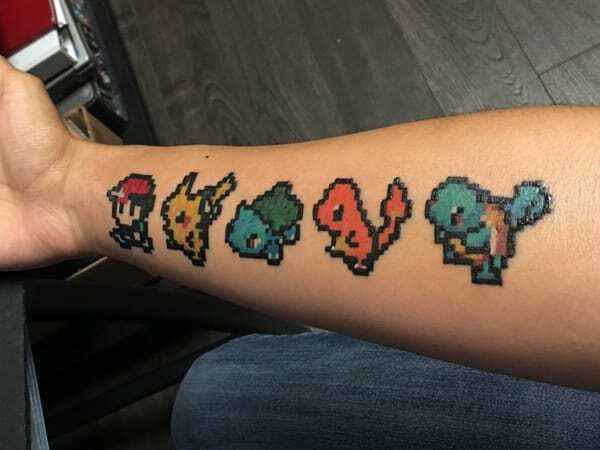 While its fanbase grew, the unwavering adoration of the franchise’s fans has not changed as time goes by to the point that some want a pokémon tattoo to show their love for the series, the game, and the manga. Where to Place A Pokemon Tattoo? The fun thing about this tattoo is that looking for a place for this tattoo is not that hard to find. This tattoo design is very versatile but most of the tattoos in this design are inked on the arms, shoulders, legs, and chest areas. Now that you know the background and some meaning on various Pokemon, go ahead and read ahead about a Pokemon that can symbolize you as a person and have it inked! There is no definite meaning to a Pokémon tattoo as the design may differ. 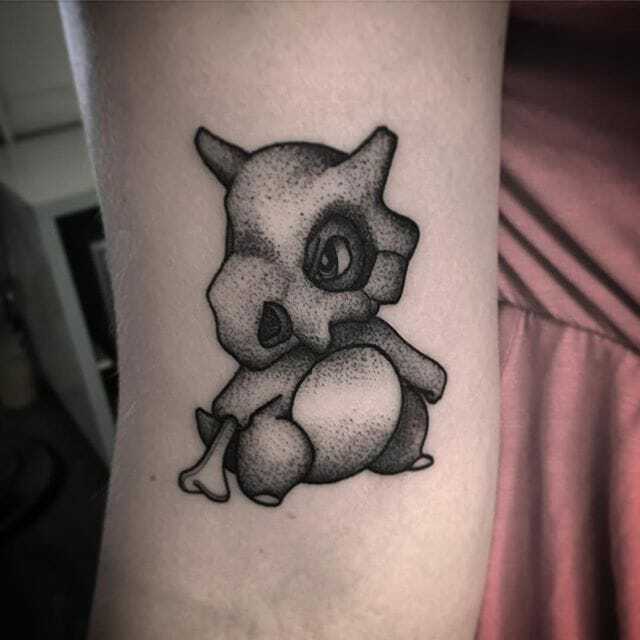 A lot of those who get Pokémon tattoos prefer their favorite Pokémon be tattooed because they can connect with its characteristics. Here are some of the most famous Pokémon and their usual symbolism on the fanbase. Pikachu is undoubtedly the most famous Pokémon as it is the mascot of the franchise. It is the long-time companion of Ash, the main character of the Pokemon series. Pikachu symbolizes unwavering loyalty to friends and strength under a cute and adorable façade. 1. 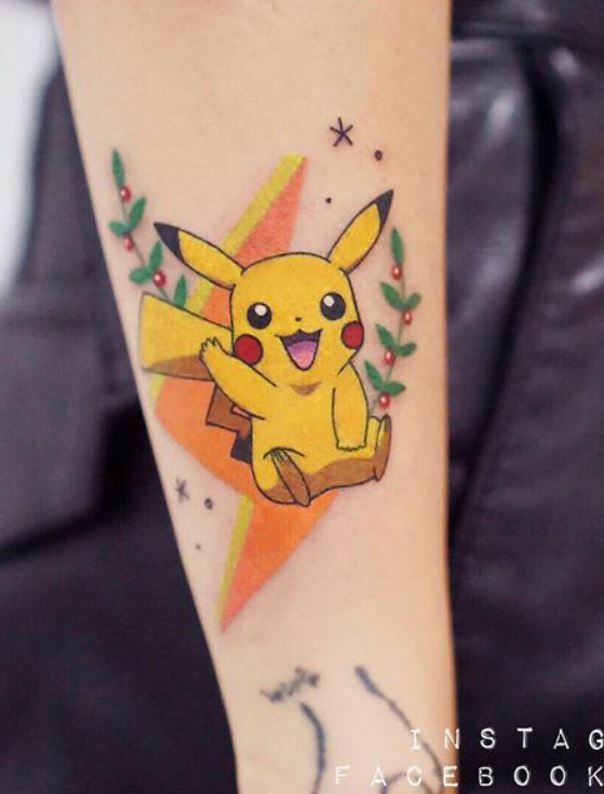 A cute arm tattoo of Pikachu with a yellow lightning bolt as a background. 2. 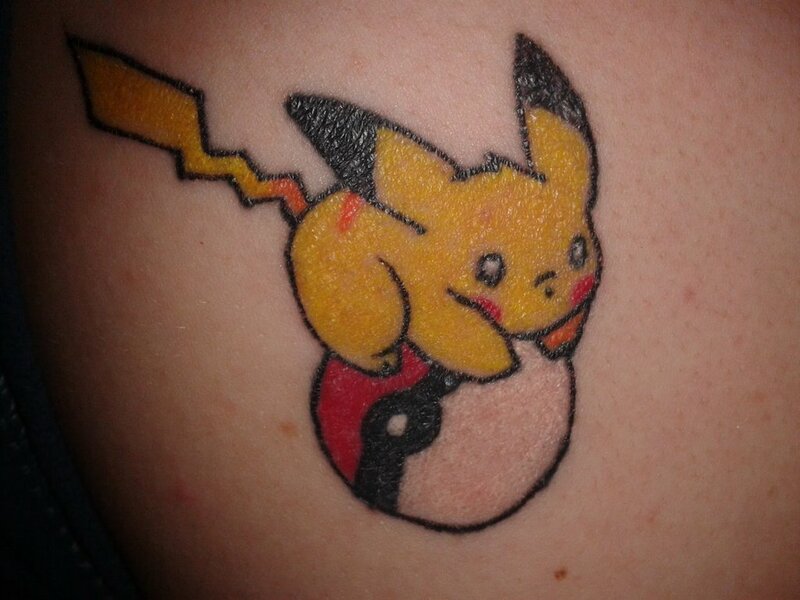 A small tattoo of Pikachu riding a pokeball. 3. A sketch-like arm tattoo of Pikachu. 4. 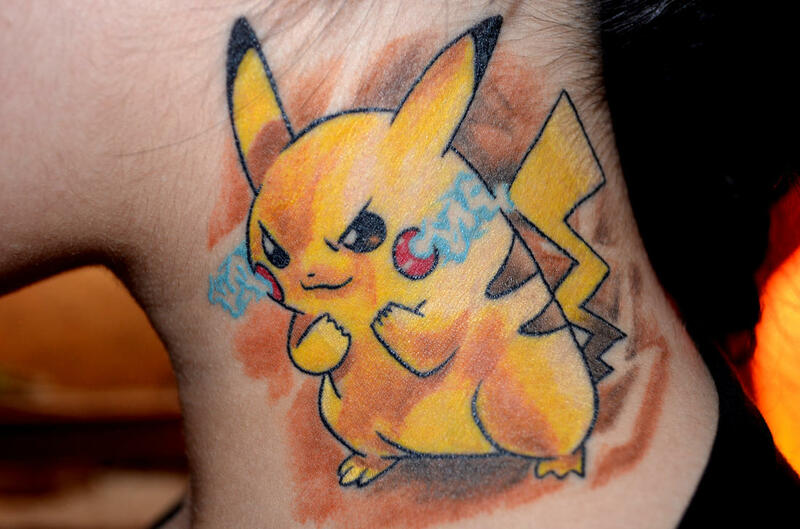 A watercolor neck tattoo of Pikachu ready to battle. 5. 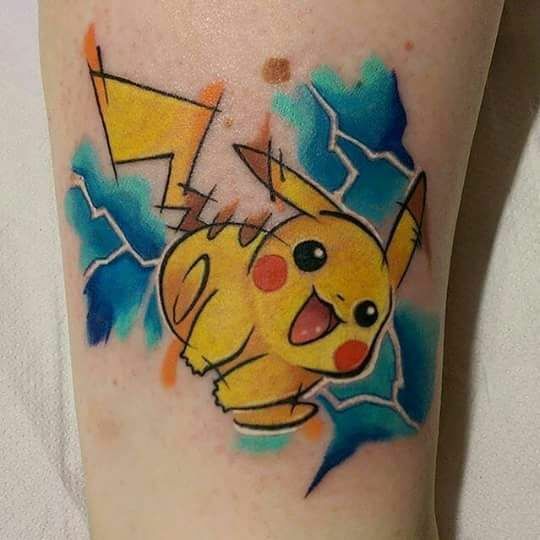 A leg tattoo of Pikachu happily playing while releasing blue sparks from its body. Charizard is one of the glorified Pokemon in the series. With its huge wings and ability to breathe fire whilst having a strong determination to be the best, Charizard has become the franchise’s symbol of determination and hard work. Want this Pokemon be tattooed on your body? Do not fret we provide you with a few images we have seen of Pokemon tattoo designs that feature this mighty pokemon. 1. 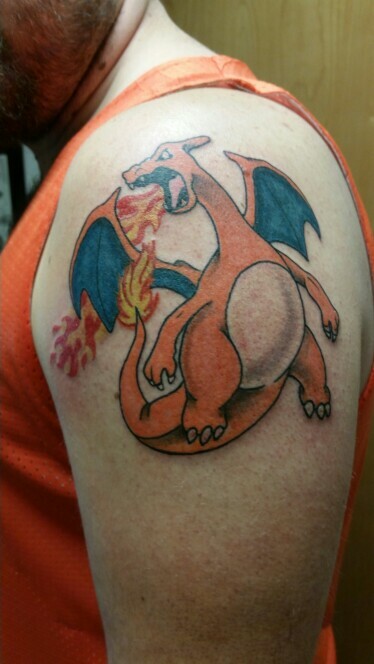 A shoulder tattoo of Charizard while flying and doing Flamthrower. 2. 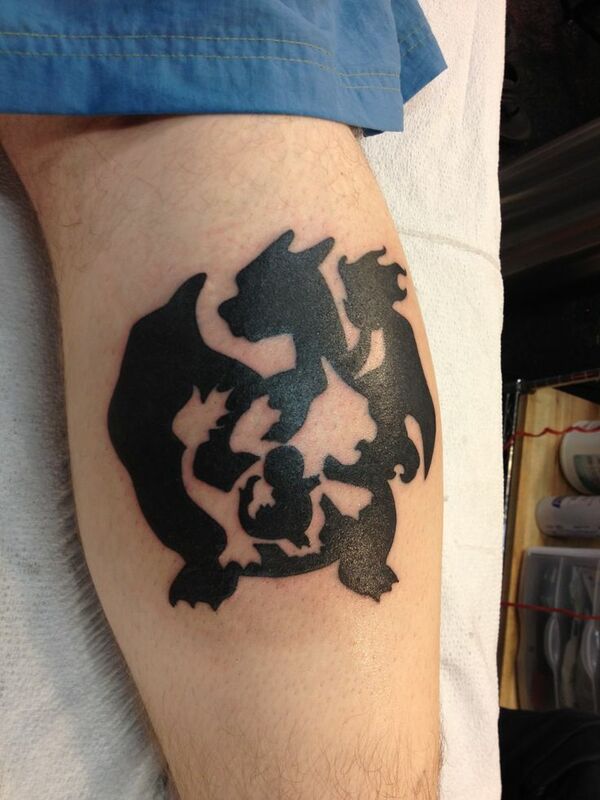 An arm tattoo of the silhouette of Charizard containing also the silhouettes of Charmeleon and Charmander, Charizard’s pre-evolution form. 3. 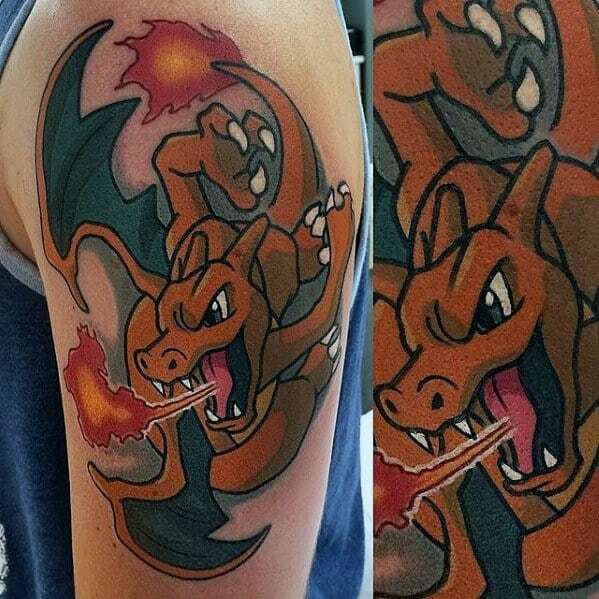 A colored tattoo of Charizard in flight. Famous for its multiple evolutions to other types of Pokemon and its cute furry looks, Eevee has been a symbol of the series to one’s versatility and innocence. Here are a few Pokemon tattoo design ideas featuring Eevee and its evolutions. 1. 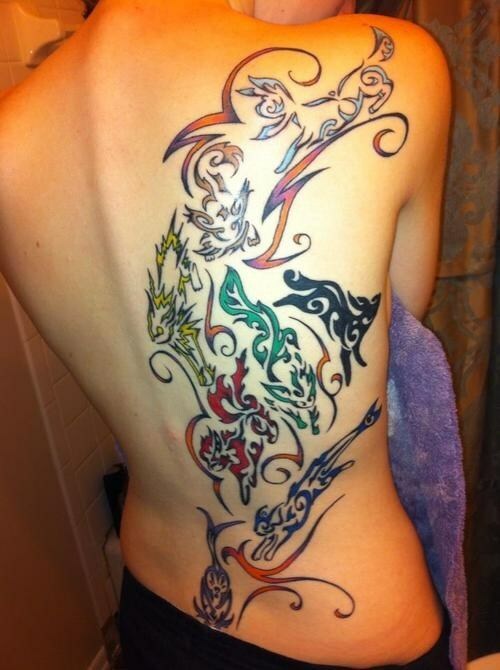 A tribal tattoo of Eevee with all of its future pokemon types. 2. 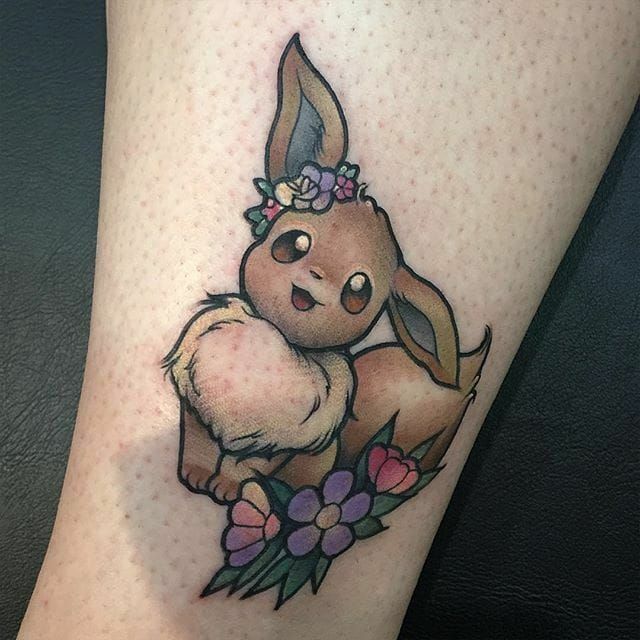 A cute Eevee tattoo with floral embellishment. 3. 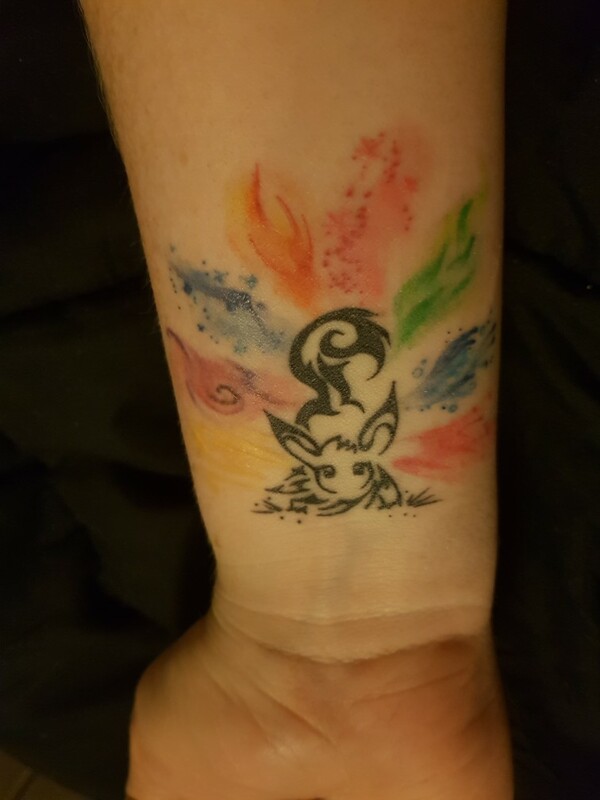 A tribal-themed watercolor tattoo of Eevee and all of her evolutions. 4. 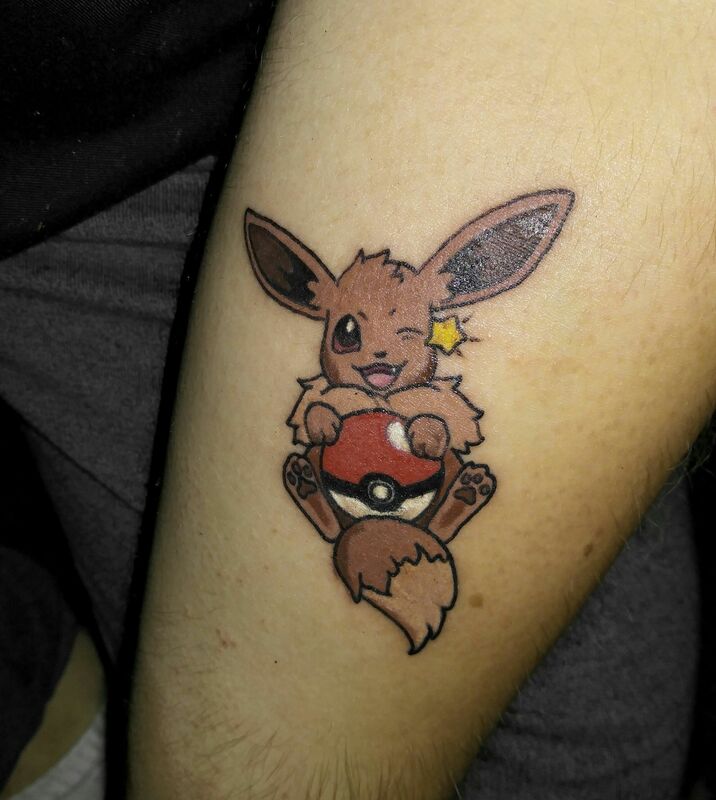 A cute Eevee tattoo winking while holding a Pokeball. 5. 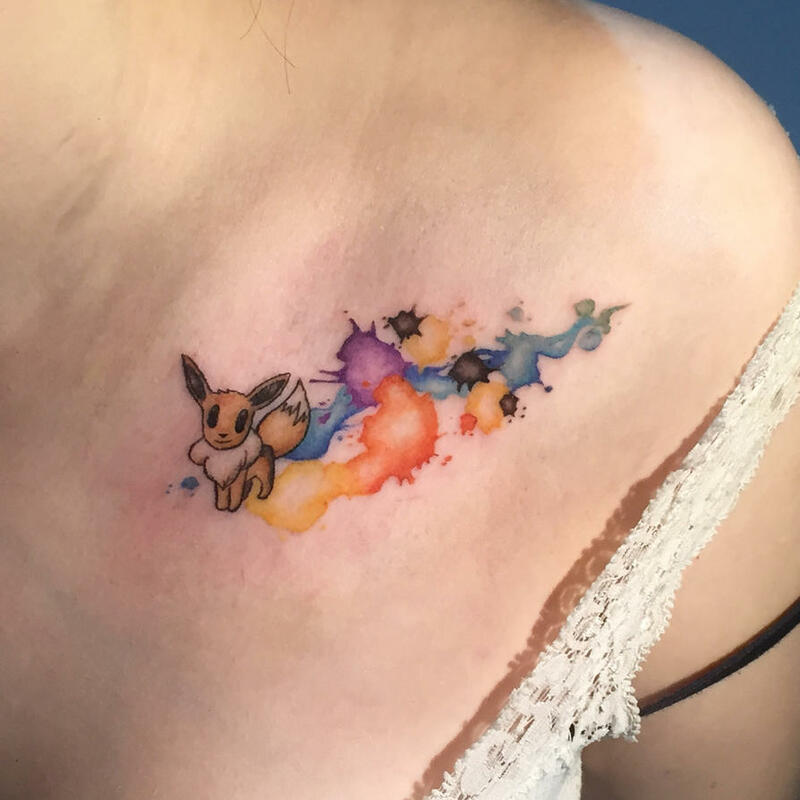 A cute and colorful watercolor tattoo of Eevee. 6. 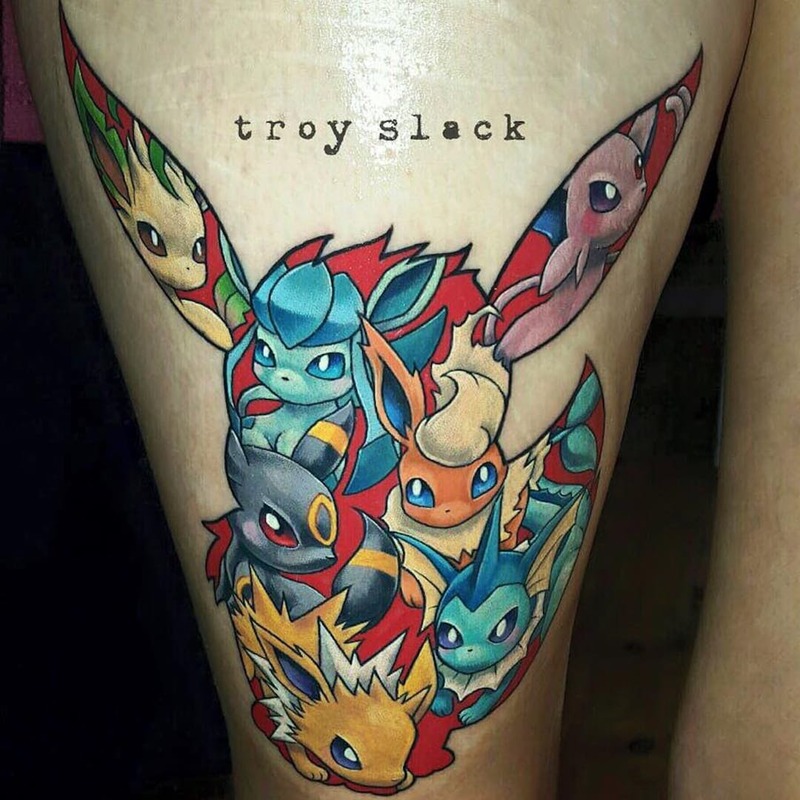 A large colorful watercolor thigh tattoo of all of Eevee’s evolutions inside the outline of Eevee. Cubone has been one of the most controversial Pokemon in the series. This pokemon’s storyline is very dark for a child-friendly franchise. 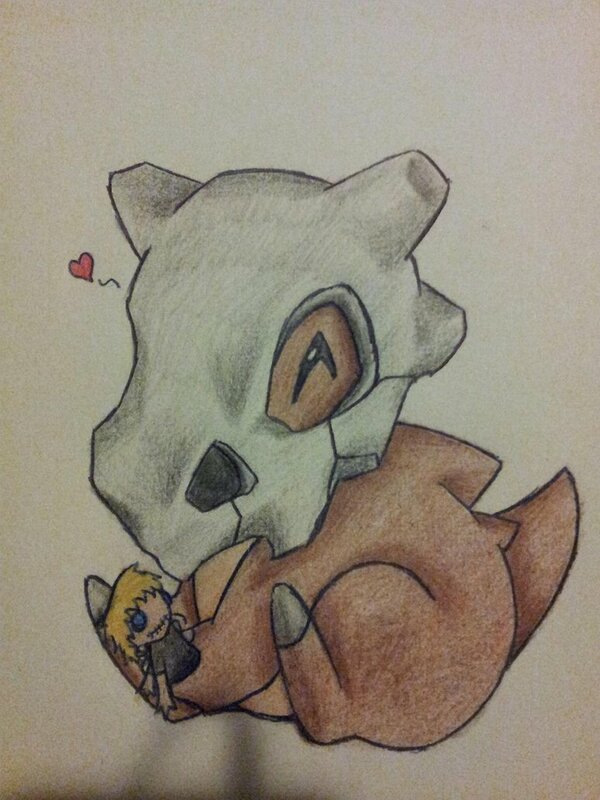 Cubone lost his mother to a syndicate at a very young age and he wears his mother’s skull as a memento to his mother. Cubone represents a dark reality in the series that not everything is a fairytale and you just have to live with the reality you are in. Like what you read? Here are a few Pokemon tattoo designs featuring Cubone that you will definitely love! 1. 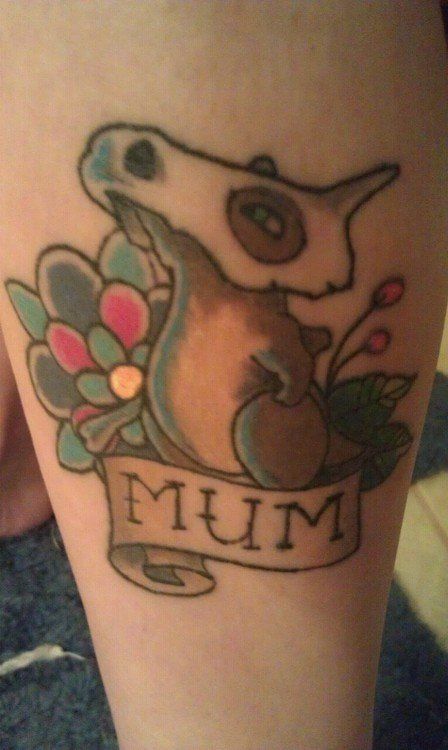 A cute tattoo of Cubone playing with its doll. 3. 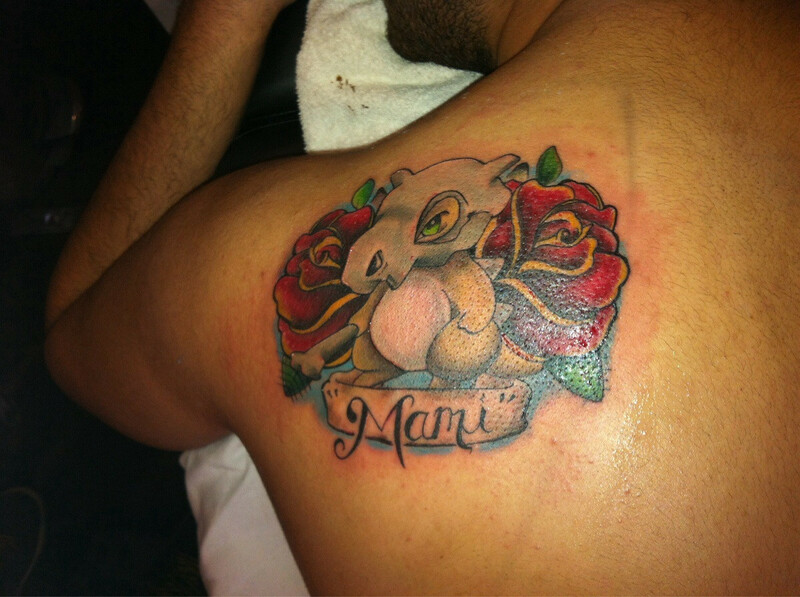 A cute Cubone tattoo looking up while remembering its mom. 4. A sketch-like tattoo of Cubone holding its bone. These two pokemon are considered legendary in the franchise. These pokemon can shapeshift into a human being and understand human speech. The said pokemon are often mistaken by those who are not closely following the franchise as lovers when in reality they are siblings. (now you know) Because of this, couples usually get this tattoo by pair. These pokemon often symbolizes sacrifice for others and loyalty. Now you know right? 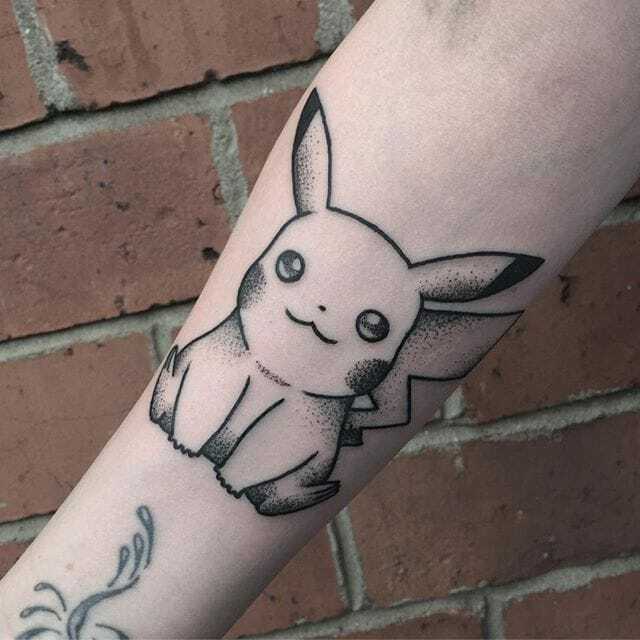 Here are a few images featuring these two adorable pokemon as tattoos. 1. 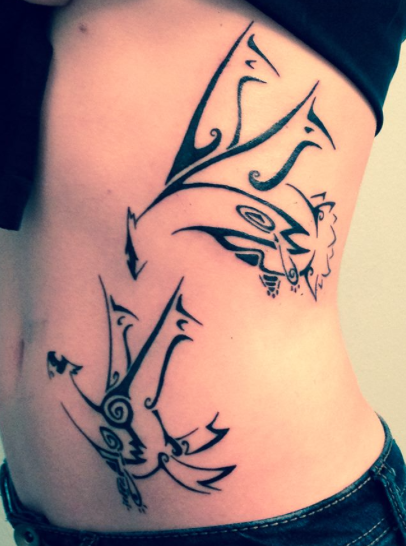 A tribal-themed tattoo of Latios and Latias. 2. 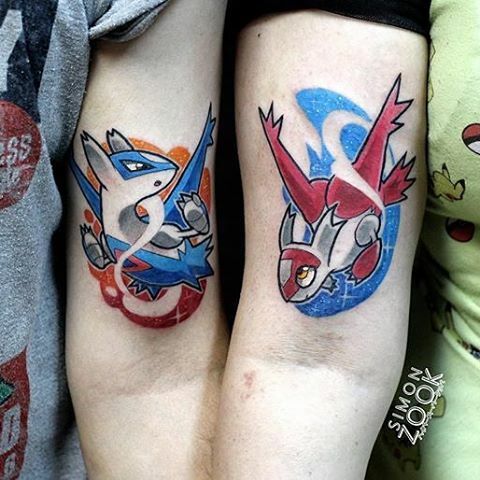 A colored couple tattoo of Latios and Latias. 3. 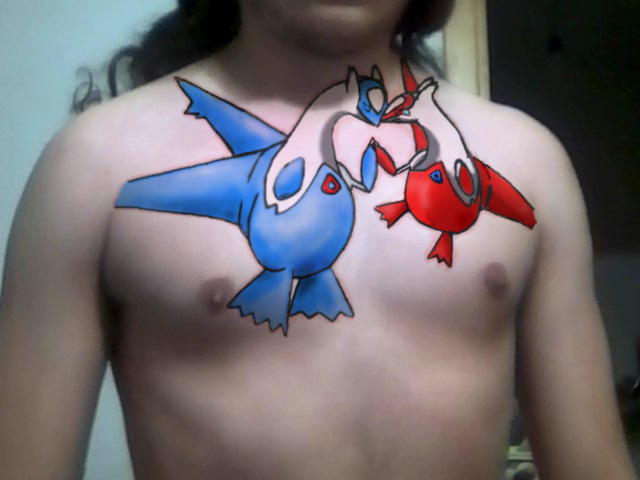 A large chest tattoo of Latios and Latias. Arcanine is the “pseudo-legendary” pokemon of the franchise. This particular pokemon has gained a cult following of some sort and rumor has it that this was supposed to be a real legendary pokemon but did not make the cut. Arcanine represents a “you don’t know me fully” persona as only a few knows Arcanine’s real status. Mystified by this pokemon? Want this one on your skin? 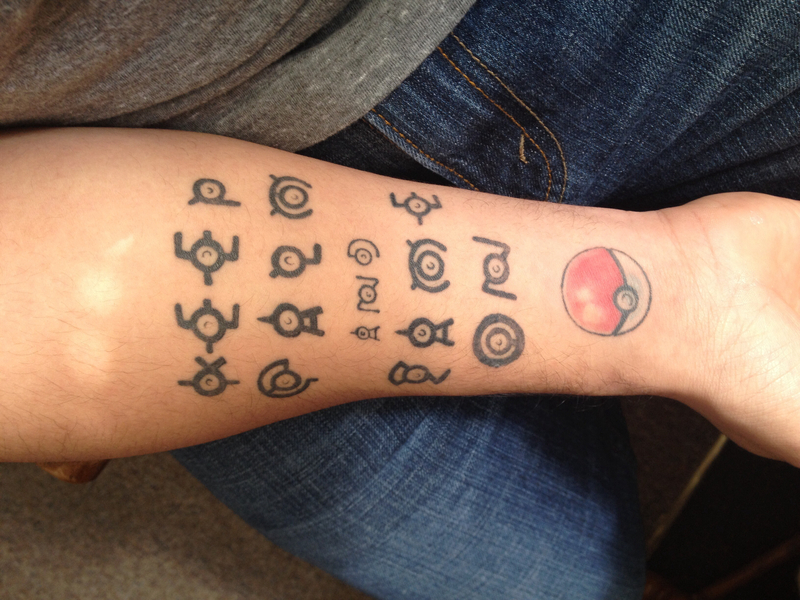 Look no further as we give you ideas for your next Pokemon tattoo. 1. 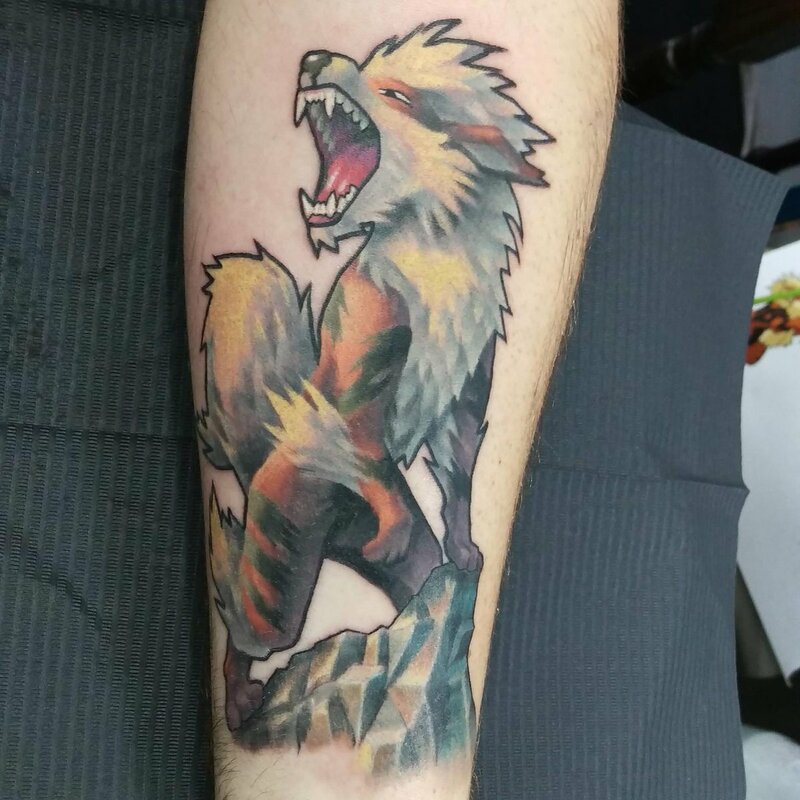 A watercolor leg tattoo of Arcanine on top of a rock. 2. 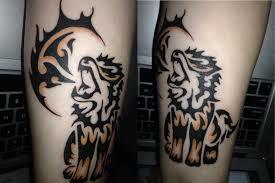 A tribal-themed tattoo of Arcanine using Flamethrower. 3. 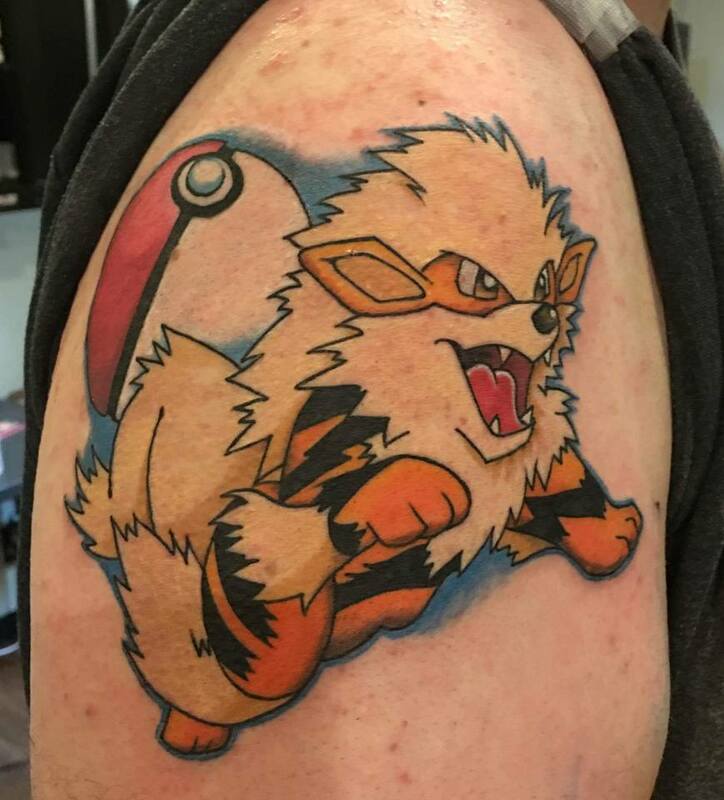 A cute shoulder tattoo of Arcanine and a Pokeball. Unown is a weird Pokemon that was introduced in the second generation of the franchise. This particular pokemon has 26 forms imitating the alphabet. Unlike other Pokemon who is featured on this list, this particular pokemon has no definite meaning as most people use Unown as a letter to form a quote or word that inspires them. Here are some of the Unown Pokemon Tattoo designs we saw that catches our eye. “Keep Calm and Game On” written in by Unown’s different forms. 2. 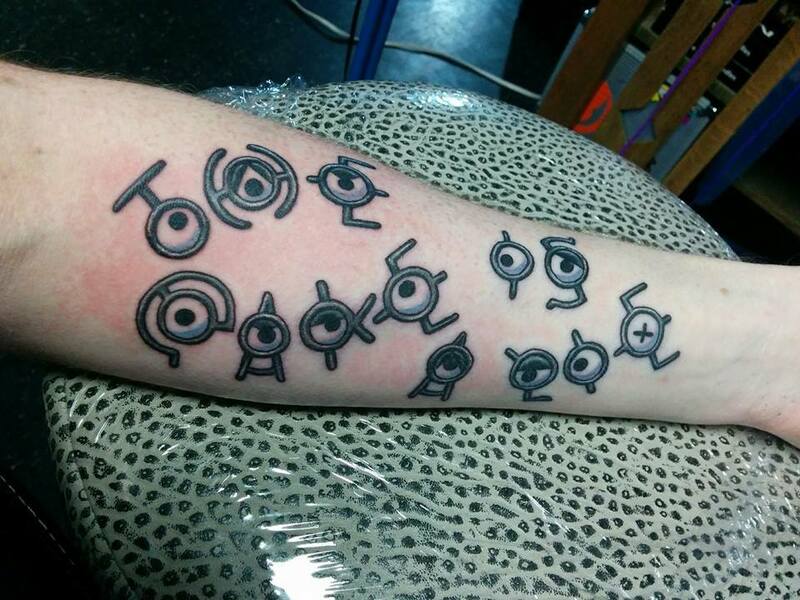 “I know my destiny” quote tattoo comprised of the various forms of Unown. 3. 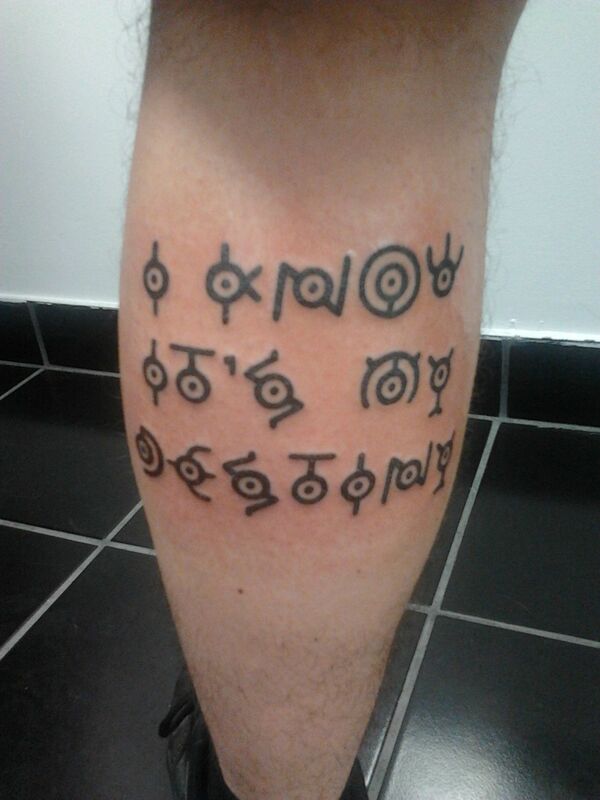 A detailed leg tattoo of Unowns. 4. 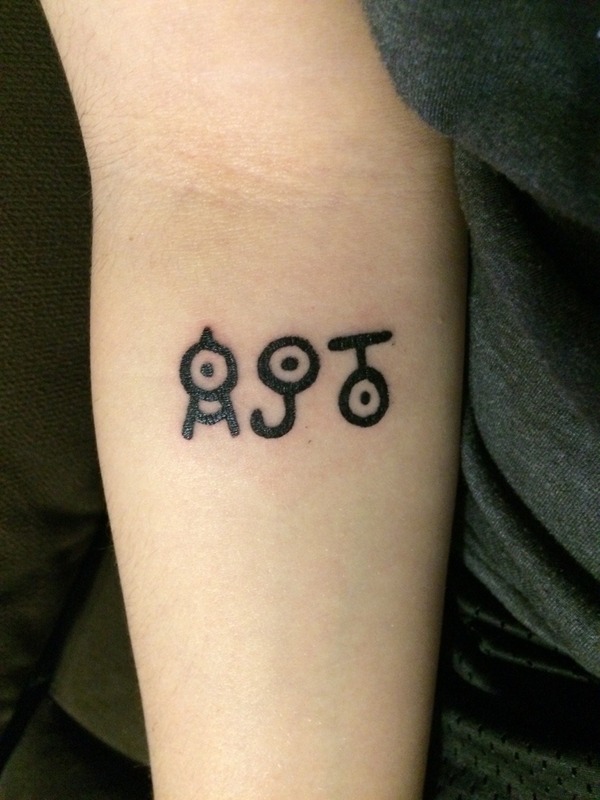 An arm tattoo of a person’s initials using Unowns. 6. 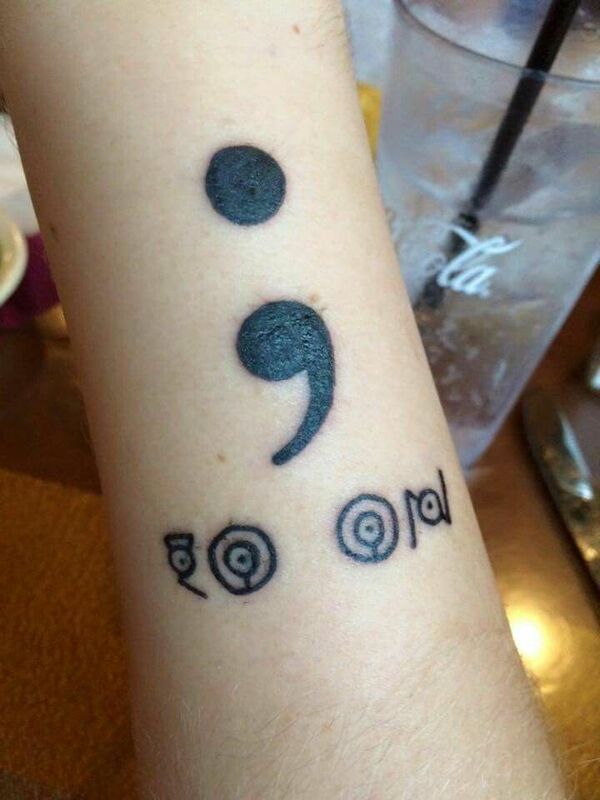 A semi-colon tattoo with the quote “go on” comprised by Unowns.